During the Queen's Balmoral break this year, we'll be flashing back to recent state and other visits received and made, and the jewels they brought out to play. In November 2011, the Queen and the Duke of Edinburgh hosted the President of Turkey and Mrs. Gul for their state visit to the United Kingdom. The Queen wore some of her favorite gems, but she also made a few interesting choices - which we love, obviously. That evening, there was a state banquet at Buckingham Palace. 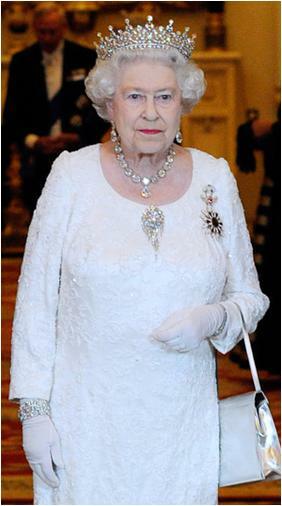 In her customary white evening gown, the Queen wore some of her favorite pieces, including the Girls of Great Britain and Ireland Tiara, the Coronation Necklace, her usual Diamond Evening Watch, and Queen Mary's Chain-Link Bracelet. But she also made a few more interesting choices: this event was her public debut of Queen Victoria's Fringe Brooch, chosen because the piece has a Turkish connection, and she wore this in the center of her gown, another unusual choice. 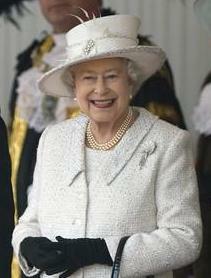 Her normal brooch spot was occupied by the Order of State of Republic of Turkey. She also differed from her normal earring selection (she usually wears the Coronation Earrings with the Coronation Necklace) and wore the Greville Peardrop Earrings. She chose the Delhi Carved Emerald Brooch to bid the Turkish couple farewell - we've seen it a few times this year, but it's an uncommon selection overall, and a nice way to wrap up the visit.